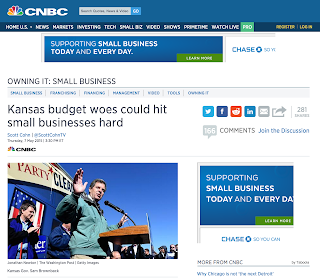 The selling point for hefty Kansas tax cuts was irresistibly seductive. Kansas can lower income tax rates, exempt business profits from the income tax entirely, and state revenue will still remain the same, or maybe even grow, and the state economy will prosper. But this premise proved to be completely false. General fund revenue did not replenish. It fell $700 million (11 percent) in one year, and the recently revised official revenue forecast now predicts that receipts will stay at that low level into the future. Nor did the economy prosper. The Kansas economy is plodding along, but growing at a rate below our surrounding states and the national average. Also proving false was the idea that Kansas could easily cut expenses. Our conservative lawmakers have labored during this 2015 legislative session to bring spending down, but they cannot do it. They have converted school funds to a block grant which is already causing problems in many school districts. They have authorized bonds for the retirement system so that regular payments into the system can be lowered. They have reduced many programs. Still, revenue has fallen so low that the budget currently in play for the next fiscal year spends $800 million more than the state expects to receive. The concept of “balance” is not hard to understand. To be financially healthy, ongoing regular revenue must equal or be greater than expenses. Every Kansan works with that same concept in managing personal finances. As a state, Kansas has lost its balance and its traditional fiscal responsibility. Ongoing expenses, calculated conservatively, are $6.5 billion and rising, while income has fallen to $5.7 billion annually for the foreseeable future. In the face of this growing chasm, our state leaders have so far only used short-term measures to slide by. First, they went to the savings account. Not quite two years ago, Kansas had $709 million in the bank. That’s now gone. Next, they cleaned out the reserves of almost every other fund in state government, including money set aside for early childhood programs in the Kansas Endowment for Youth Fund. Then, they put part of the problem on the credit card. Here’s how that works: Through the gasoline tax, a portion of the sales tax, and car registration fees, Kansas raises money for its highway fund. But in this fiscal year, 40 percent of the money raised will be transferred to prop up the general fund while our state government borrows $298 million to keep the highway fund afloat. For the next fiscal year, the governor proposes further large transfers from the highway fund while borrowing $250 million to pay for a diminished road program. Using up reserves and transferring money from other funds does not correct the imbalance. Those short-term measures only delay the reckoning, while making Kansas more destitute in the process. Although lawmakers have been unable to reduce spending enough to match the low level of revenue, it is still possible that expenditures might go down further, but in a damaging, unplanned way. Education and other state programs are at great risk. Without new revenue, the bills will go unpaid. If that happens, lawmakers have utterly failed. Restore balance, lawmakers. Show fiscal responsibility and make ongoing receipts match expenses. Deep and unaffordable income tax cuts caused this problem. That’s the place to look for a correction. — This column originally ran in a variety of Kansas newspapers May 3 and 4. How Big is Kansas' Budget Hole Anyway?